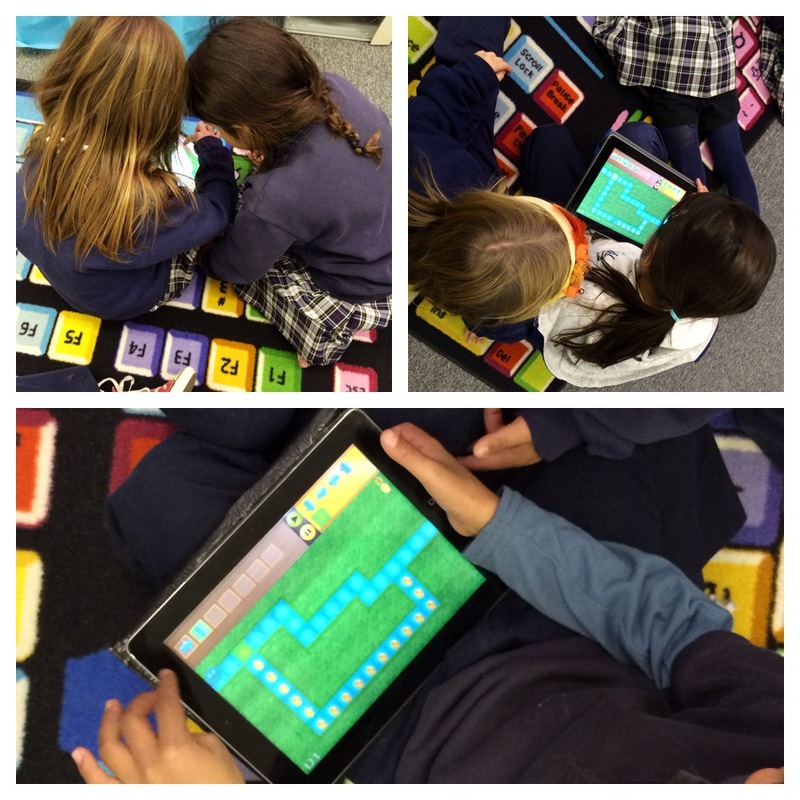 Day 2 saw 1st Grade, 2nd Grade, 7th Grade, and 8th Grade start their Hour of Code activities. 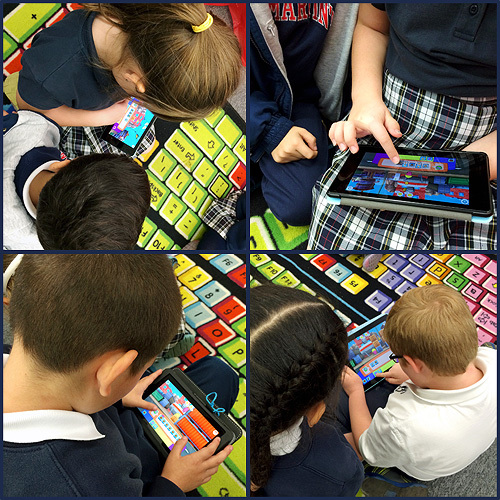 1st and 2nd Grade used apps on iPads and Android tablets. 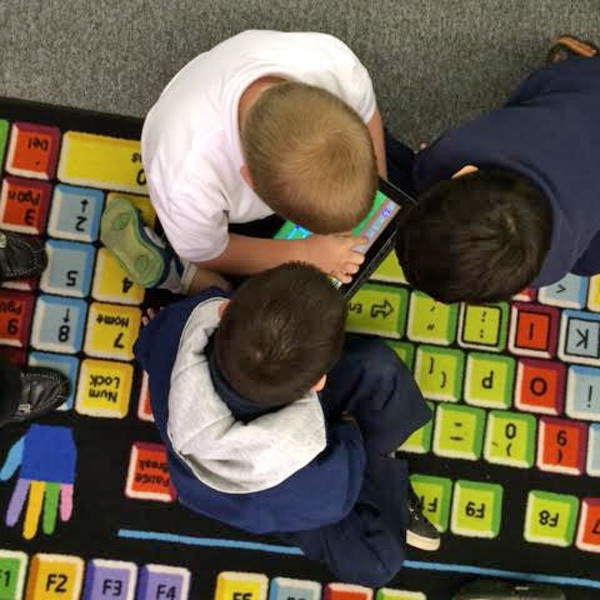 After trying to program Mrs. Sedgwick to walk to the door, 1st Grade used the app, The Foos, to program each Foo to solve problems, gain abilities, collect coins and stars, and to explore Fooville. As students complete levels, the programming that each Foo requires gets more complex. Today, the 1st Grade students got through the first 8 levels with the Police Foo and are currently working on the next 8 levels with the Builder Foo. It was great to see the students working together to solve the levels as they got tougher. I’m excited to see how far they can get in their second class this week. The Foos, and other coding game apps like this, help students to analyse and solve problems and teach basic programming concepts such as writing algorithms and using loops. The Foos runs on Android tablets, iPads, and on computers in a web browser. Students won’t have time to solve all of the levels of The Foos in the lab this week, so you can have your child do this at home. 2nd Grade also started off the day trying to program Mrs. Sedgwick to walk to the door. 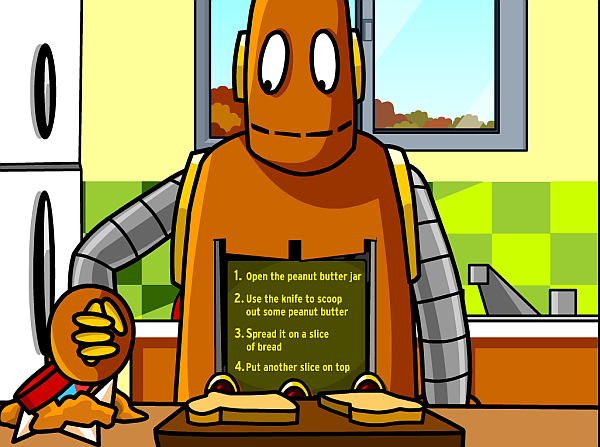 They learned that computers (and humans pretending to be robots) need very specific instructions in order to be able to do anything. After this, students were shown a little about the iPad app, ScratchJr. The exciting thing about this app is that it’s not a leveled game that teaches coding concepts, but it’s a coding environment that lets students create animations and tell stories with code. The 2nd Grade students are creating a two scene animation that will move a character across the screen and other things of their choosing. The picture above is the start of one pair of students animation. I’m excited to see how these turn out at the end of the week! If you have access to an iPad, ScratchJr is a free app that lets students learn about events, sequencing, loops, and more. Just like 6th Grade yesterday, 7th & 8th Grade students watched the Top 10 Reasons to Code video, learned about the people on the posters in the Computer Lab, and then worked on researching Grace Hopper. I’m looking forward to the debugging activities that they will be doing later in the week in Scratch. Day 2 was a busy day and there’s a lot more coming this week. 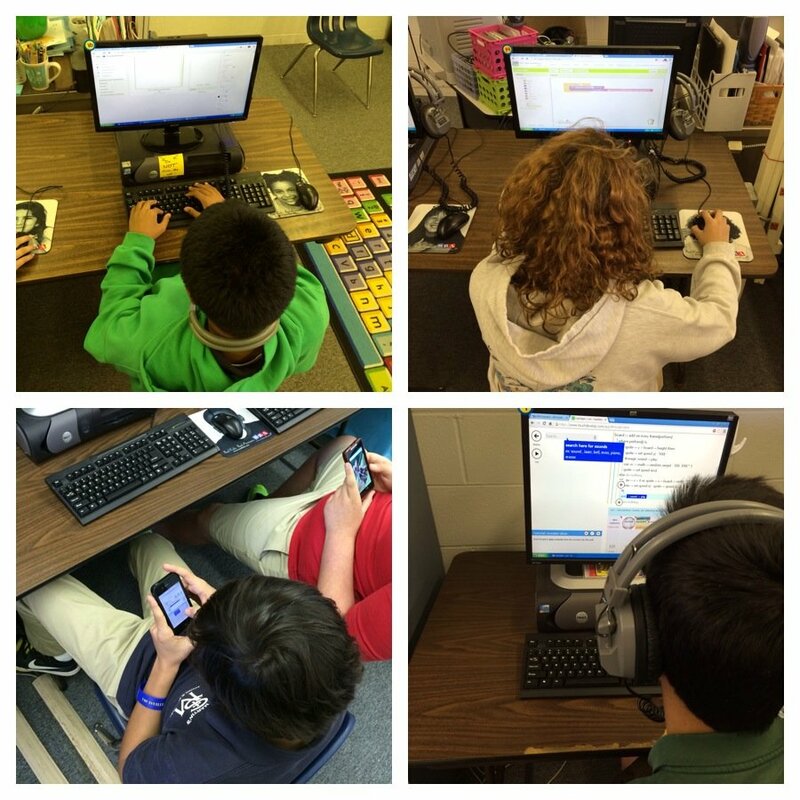 Stay tuned and be watching for completed coding projects from 2nd – 8th Grades. 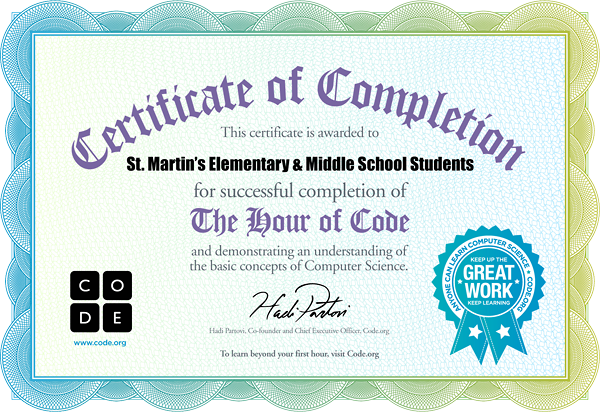 In celebration of Computer Science Education Week, all K-8 students are taking part in the Hour of Code. This week is a teaser of what’s to come during the 2nd semester when all classes will focus on Computer Science in more depth but it’s exciting to participate in a worldwide event like this! Here’s what happened today. … one of the students said “Well, he DID open the jar.” Yes, he did. You have to be very specific when programming a computer. The girls (5th Grade is one of our two all girls classes) knew who two out of the five (we don’t have the Ashton Kutcher poster up in the lab) were. They didn’t know Mark Zuckerberg though when I mentioned Facebook, they knew who he was. 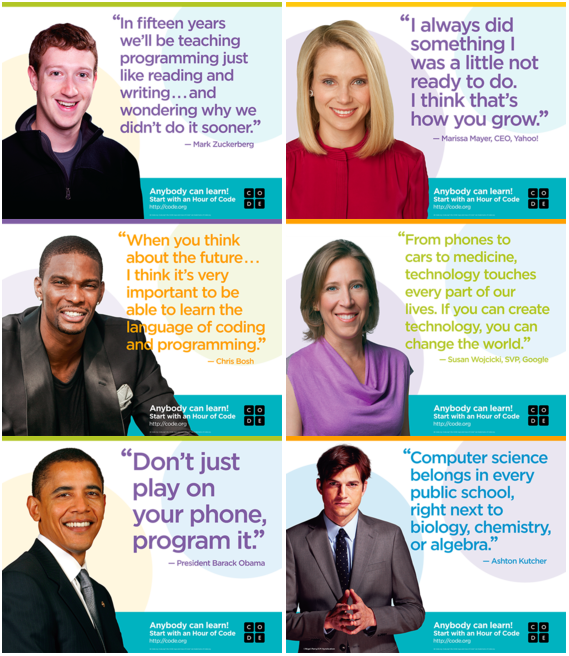 I loved the reaction when I talked about who the women in the posters were (especially Susan Wojcicki – what 5th grader doesn’t love YouTube) and about Grace Hopper and why she is honored during Computer Science Education Week. 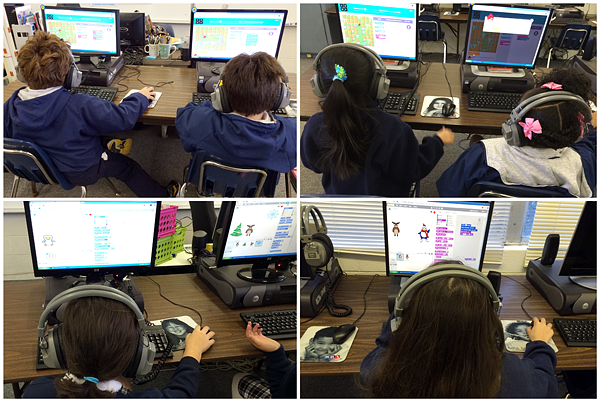 Ready to code, 5th Grade also started working on animating their names in Scratch. I am looking forward to their finished animations and maybe some coded Christmas cards next week, too! What does Grace Hopper have to do with Computer Science Education Week? The best part of this research was hearing the girls exclaim “She was amazing!” and ask “Why don’t we know about her?” Well, now they do! Did you know that the President also tried his hand at coding today at the White House? He was using Code with Anna and Elsa from Code.org. Some of our students have tried this and others will at some point. 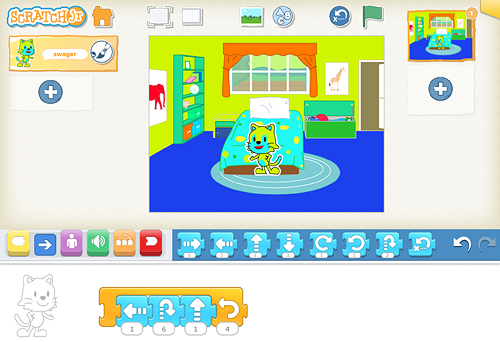 If your child is interested in coding, you can set up an account for them on the Scratch Website or install the Offline Editor for them to use on a home computer. 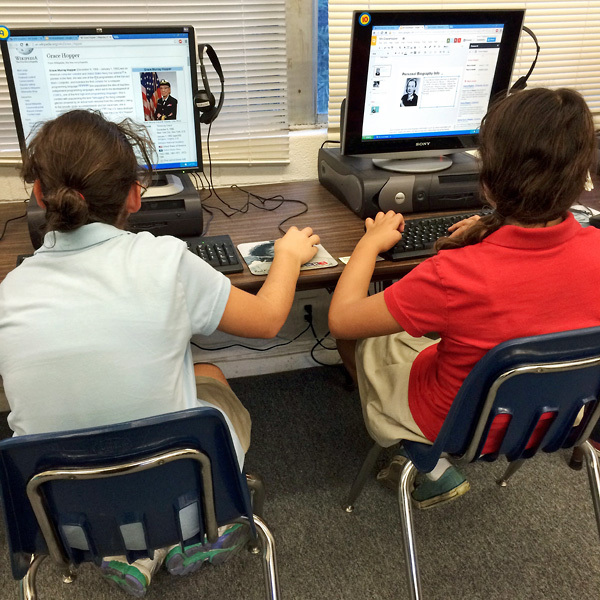 At school, students use either the Offline Editor or the Online Editor without saving and their completed projects are uploaded to a single account for the Computer Lab. 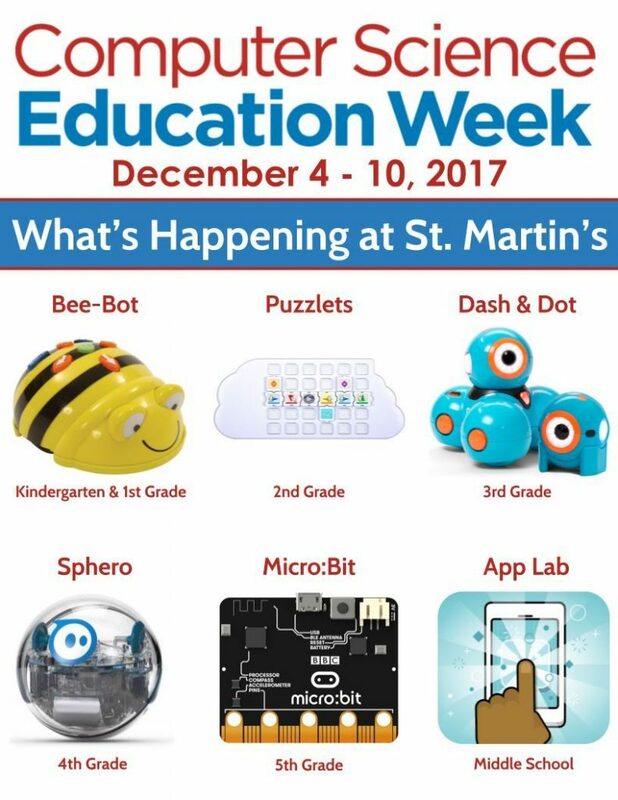 Next week, December 8th – 12th, is Computer Science Education Week and St. Martin’s students are once again taking part in what may be the biggest educational event ever. During their computer class time, students will be learning some basic coding skills and concepts with a variety of Computer Science activities. Last year over 15 million people took part and this year the goal is to reach 100 million people who have completed an Hour of Code! 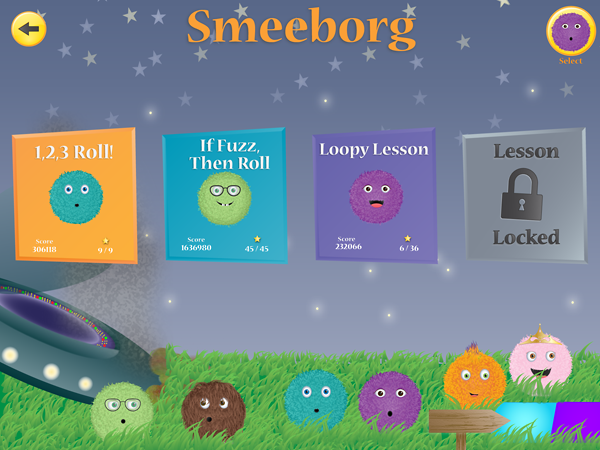 Helping the fuzzFamily explore Smeeborg with the Kodable app and learning about programming logic, sequences, loops and more along the way. Learning about algorithms, sequencing, and debugging with Code.org’s Computer Science course. 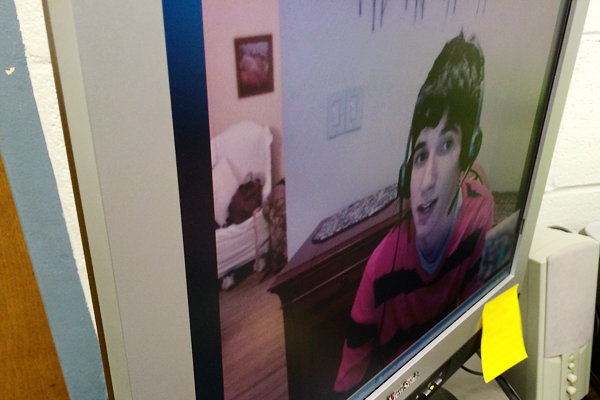 Creating an All About Me project or interactive greeting card with the Scratch, Jr. app. Programming an interactive greeting card using Scratch, a visual programming environment from MIT. Learning about Grace Hopper, the woman who is honored during CS Education Week, and debugging Scratch code. 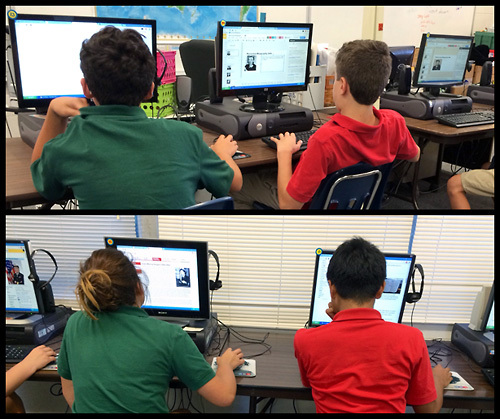 This blog will be updated with what each class will be doing as the week progresses. Some of the completed coding efforts will also be shared on the blog after the week is over. If you are interested in what you child is doing each week in the Computer Lab, head over to the Computer Lab Wiki. 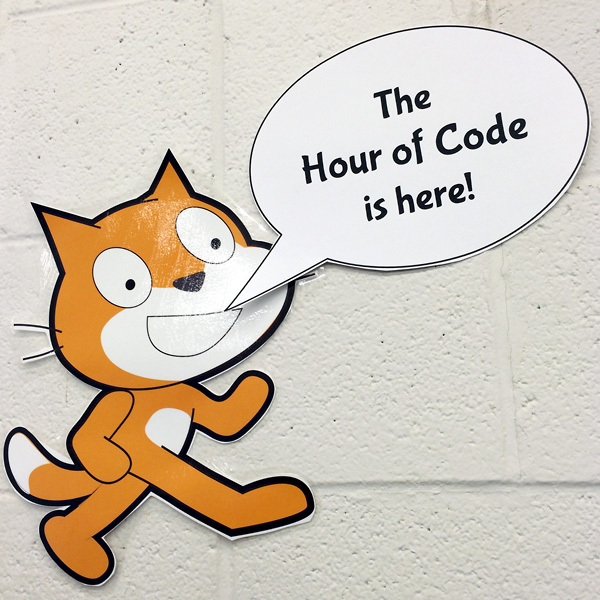 If you want to know more about The Hour of Code, you can visit the official website at hourofcode.com. 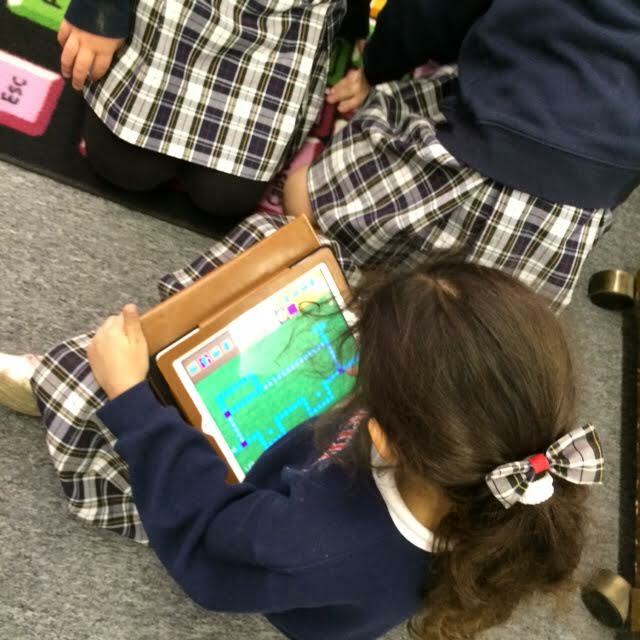 Day 3 of The Hour of Code brought Kindergarten, 4th Grade and 6th Grade (back for round 2) into the lab. Since Kindergarten has also been using Bee-Bot this year, the day started out talking about programming with the Bee-Bot and having the Bee-Bot move in a square. After this, Kindergarten learned a little bit about the fuzzFamily and how they came to be on Smeeborg and then they saw a demo of the first level of the Kodable app. Then it was time to get into pairs (or a trio for the boys) and try out the app! There was a little confusion with the conditionals but everyone figured it out and had a great time. I can’t wait to see how far they get tomorrow. 4th Grade was the final class for the day. After watching the The Hour of Code introduction video, 4th Grade started to work their way through the Code.org drag & drop programming option for the 20 minutes they had left of class. They made really good progress and I can’t wait to see how many of them make it through the rest of the levels tomorrow. Tomorrow, it’s the second day of The Hour of Code for Kindergarten, 1st Grade, 4th Grade, and 5th Grade and day 4 for the week of The Hour of Code! Deal on Kodable Pro: The Kodable app that we are using for The Hour of Code is a free app but there is also a Kodable Pro app (with even more levels) that is normally $6.99. For Computer Science Education Week, you can now get this app for $0.99! 1st Grade, 7th Grade and 8th Grade got their first chance to participate in The Hour of Code today and we were trying lots of things in the lab that we’ve never done before! 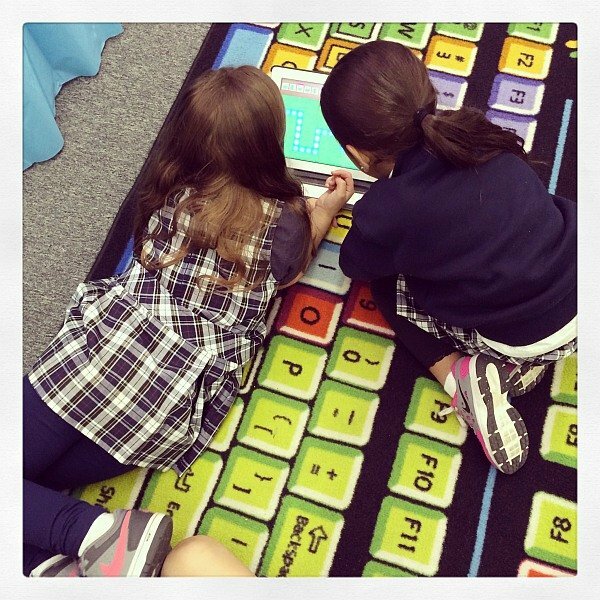 Once I decided to have all grades participate in The Hour of Code, I knew that I wanted to use an iPad app with Kindergarten and 1st Grade. 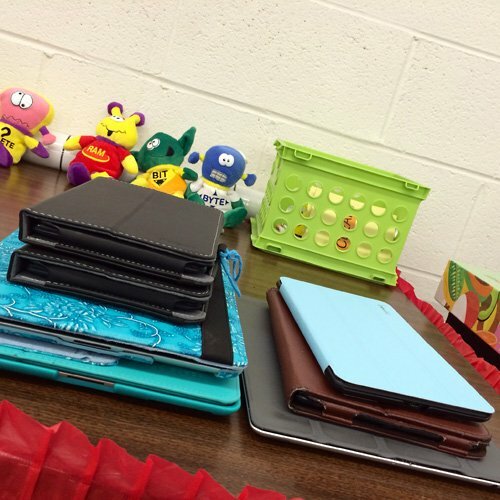 The problem was, we don’t have iPads at school – well other than some of the teachers’ personal ones. So, I set out to borrow enough that we could have an iPad available for each pair of students and YAY! we got enough for this to happen. Thank you so much to our school secretary, Mrs. Wright, Ian’s mom, and Diya’s mom for loaning their iPads for The Hour of Code. 1st Grade (and Kindergarten and 2nd, too) have been doing some pre-coding activities with Bee-Bot since the beginning of the year so the day started out talking about what programmers do and how they have been programming Bee-Bot. After this introduction, I told 1st Grade the story of the fuzzFamily and how they came to be on the planet Smeeborg and explained what they were going to do to help them explore the planet. Then it was time to try out Kodable! Oh what fun and great excitement when everyone got past the “pink” level as they called it. I am excited to see how far they will get in the app when they return for more on Thursday. 7th Grade watched The Hour of Code introduction video and discussed what coding is. They were then introduced to MIT App Inventor and got to work programming their very first Android app! Everyone completed their app (even though bringing up the emulator is extremely slow) and will continue with the second version of the app on Friday when we should have at least one Android device to test them on. Fingers crossed that we can get this working (since it will have to be using a USB connection I think) – this should be great fun if it works! 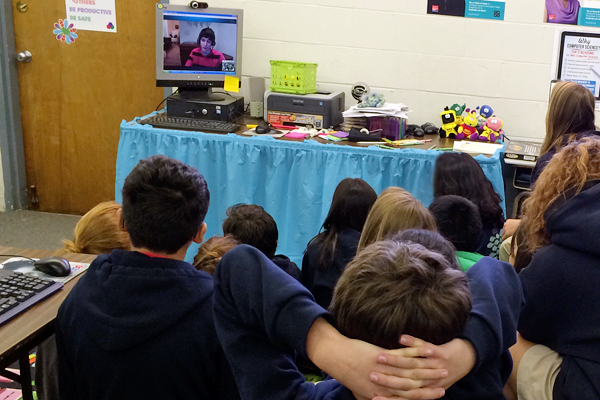 8th Grade’s class started with watching The Hour of Code introduction video and discussing what coding is. After this, the students were introduced to TouchDevelop. Our school has a no personal devices policy for students but the 8th graders were allowed to bring in their devices to use during their Hour of Code development. Half of them did bring in their devices though a couple of the students ended up using the computer instead of their device when they actually started to create their apps. It will be interesting to see who continues to use devices and who else may bring their device on Friday when they’re back in the lab for more. By the end of the class, we had a few completed apps and others who were almost done. Friday’s class will start off with a demo of some of the apps and they’ll be shared on this blog and the student’s Google sites once the week is over. Now it’s on to Day 3 with Kindergarten, 4th Grade and more MIT App Inventor with 6th Grade.